“A sceptre spoken of in lore and sealed away since days of yore unleashes its forbidden power and heralds Trodain’s darkest hour.” It’s a stark poetic rhyme that opens Dragon Quest VIII: Journey of the Cursed King, but one that helps players understand the immediate plight that they are faced with. When the scheming court jester Dhoulmagus unleashes the ancient sceptre’s power on Trodain castle, the spell turns King Trode into a troll and princess Medea into a gallant horse. With the castle’s inhabitants turned into plants, a lone Royal Guard somehow left unaffected becomes the kingdom’s only hope at reversing the potent spell. After we see the hero’s pet mouse scurrying through the undergrowth, it isn’t long before we are introduced to the party that has given chase to Dhoulmagus. I instantly fell in love with the characters, thanks largely in part to a hilarious script and stellar voice actors that make the most out of every line to breathe life into the world. While the unnamed hero is a silent protagonist in Journey of the Cursed King‘s fantastical tale, your party will eventually be comprised of the sorceress Jessica, Knights Templar noble Angelo, and Yangus who abandoned his career as a bandit after the hero saved his life. With Trode and Medea’s fighting prowess limited by the curse that has been cast upon them, once gathered together it is these four characters that unite to take down Dhoulmagus. It is an unbelievable and captivating adventure that follows, and, having missed the original release on PlayStation 2, I hadn’t realised that LEVEL-5 had developed the game. Known to the Nintendo devout for their work on the Professor Layton, Inazuma Eleven, and Yo-kai Watch series, the Japanese studio also worked on the lauded Nintendo DS release, Dragon Quest IX: Sentinel of the Starry Skies. Their talent for the role-playing genre is clear, with Ni no Kuni: Wrath of the White Witch being another shining example of how masterful their world building can be. Players don’t want to simply wander a world they want to feel like they play a part in it, and that is exactly what LEVEL-5 has achieved once again in Journey of the Cursed King. The sprawling world map is a wonder to explore, ridden with monsters that freely roam its lands. 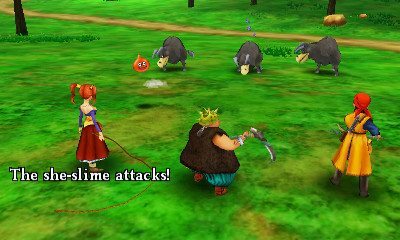 With a decision made to remove random encounters, it is left to the player to decide whether to engage the characterful critters that they cross paths with. Fighting them is necessary to sufficiently level your party to survive the many hard-fought battles that you will have to face, but the option to swerve around them can help save time when running between locations. These turn-based instances play out as expected, with the player choosing what to do with their party characters each turn. Whether mercilessly clobbering the enemies with a club, using magic, healing with items, or unleashing abilities, there are plentiful ways to approach these battles as you claw your way to victory. A more unique element comes in the tension system, which allows you to sacrifice a character’s turn to instead let them ‘Psyche Up.’ This can be done over multiple turns to increasingly build their tension and then, whenever you choose to unleash it, they can attack to deal greater damage. It is risky in tougher battles, but is among the more interesting ideas that Journey of the Cursed King throws into the mix. As with any role-playing game, that is largely how you will be spending your time. The Nintendo 3DS versions adds a new ‘Speed Up’ feature that sees you rattle through battles far more quickly, which is certainly appreciated when playing on the go. Beyond the Quick Save option can save you trekking back to the nearest town to save at a Church, which can help alleviate concerns when the battery light starts to flicker red. For those that have already seen the PlayStation 2 release through to completion, it will be the new content that will reel you in once again. 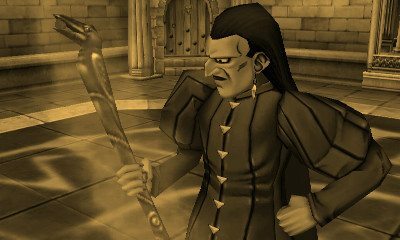 New characters Red and Monster Arena proprietor Morrie can be recruited to your party, new cutscenes reveal more about the backstories behind those in your party, and a new in-game camera lets you snap memorable moments to share online, as StreetPass Postcards and on Miiverse. Away from the tale that you become embroiled in, players can spend time at casinos, hunt out mini medals for the Princess of Medals, complete photographic challenges listed in Cameron’s Challenge Codex, and train monster teams to battle others in the Monster Arena. With the promise that “rare bonus items” will be delivered up until September, it is clear that this is an adventure that Nintendo wants you to enjoy for many months to come. This is the Dragon Quest experience that you have been waiting for, woven around a captivating tale and a wondrous world in which to tell it. This becomes another unmissable addition to the impressive RPG library that the Nintendo 3DS has built, kicking the year off with a jubilant fanfare.